I have an ILNP Ulta Metallic polish to share with you today. I love ILNP's take on metallic colors and how many of them have a holo twist that is executed beautifully. This one I have today does just that! 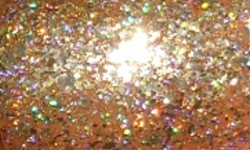 Empire is a true gold with made up of thin metallic flakes and holo micro flakes. Color: Gold isn't always my best color, but I still love it. The blingier the better. This is a great blingy gold. I love the use of metallic flakes and that little added holo flare! Formula: This applied smoothly and nicely. I used 3 coats here. This has a similar formula to Juliette which I wasn't entirely impressed with, but I prefer this one. The flakes in Juliette were chunkier where I felt like there needed to be some sort of tinted base in the background. Empire the flakes seem a teeny bit finer so it gives a more opaque look on the nail. Overall: This is a gorgeous and beautifully made blingy gold polish. I love the use of flakes and the opacity of the formula for a flakie polish. The holo sparkle is a nice and perfect touch. No complaints!